Tsagaan Sar, the Mongolian Lunar New Year! Tsagaan Sar is the Mongolian Lunar New Year festival that has been celebrated for thousands of years by ethnic Mongols. Tsagaan Sar literally mean “White Moon” but it might as well be “mountains of mutton and rivers of vodka…” The pile of dumplings I put a dent in sits in front of the “uuts” or cured mutton back and tail. The first day of Tsagaan Sar, and of the Mongolian lunar calendar, differs every year. The start of Tsagaan Sar falls on the new moon two lunar months after the winter solstice. While it generally coincides with the Chinese New Year, a Mongolian friend told me that it usually starts a day before or after the Chinese holiday. 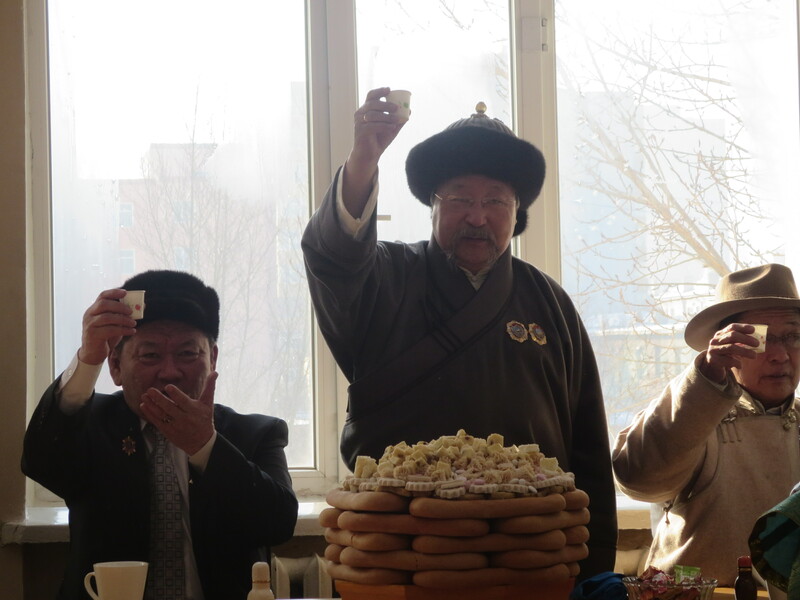 While Tsagaan Sar is officially only three days (up from two days last year) the first day back to work generally consists of Tsagaan Sar festivities. 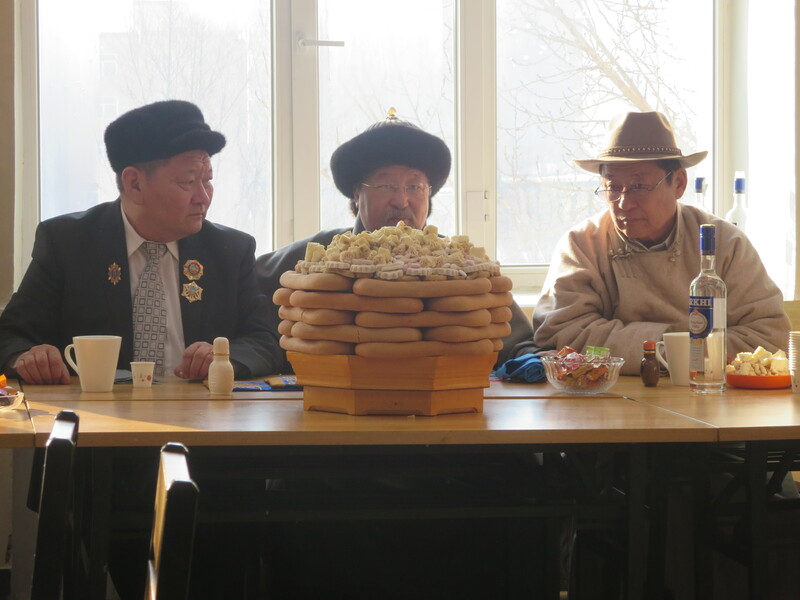 Here school officials await the Tsagaan Sar Greeting Ceremony with a tower of biscuits and “airal,” dried cheese curd, in front of them. How is Tsagaan Sar usually celebrated? 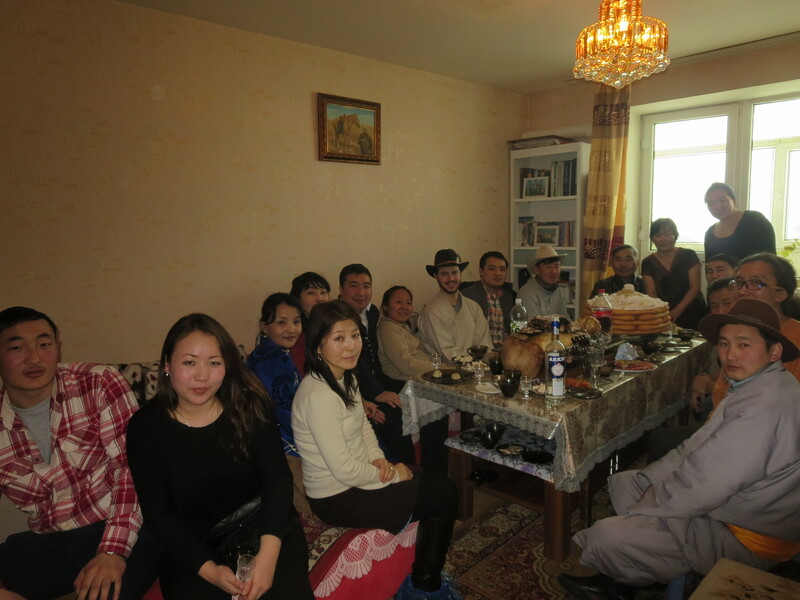 During Tsagaan Sar, Mongolians are required to, if possible, visit with all of their living relatives and family friends. The aim is to catch up on important news from the last year and wish each other well for the coming New Year. 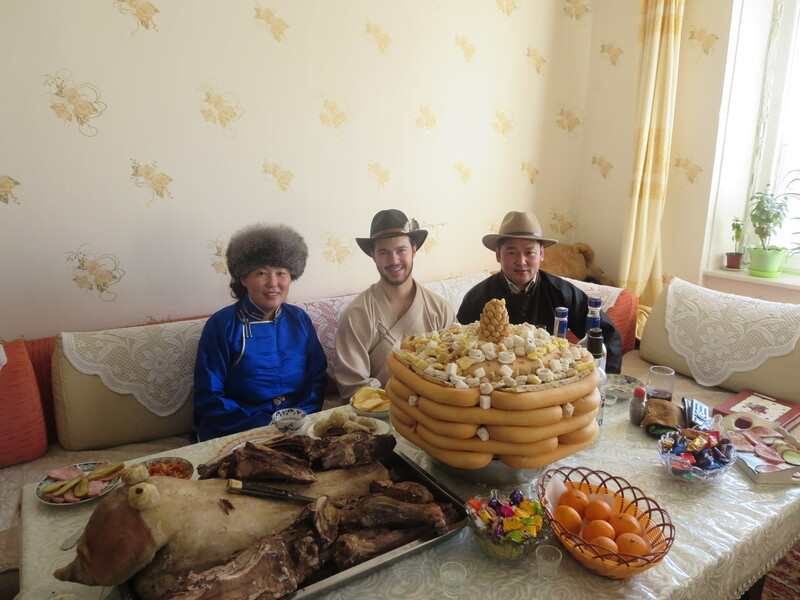 The celebration is officially celebrated for three days, but in reality the visits go on for days afterwards, even weeks in the countryside where herders have fewer formal obligations. There is an elaborate and lengthy protocol to be observed by hosts and guests involving ceremonial greetings, the consumption of delicious foods and beverages, toasting, and gift-giving! My visit to my friends Shine and Oko was a wonderful time! Like many visits, I was shown their family photo album and caught up on news from their last year! 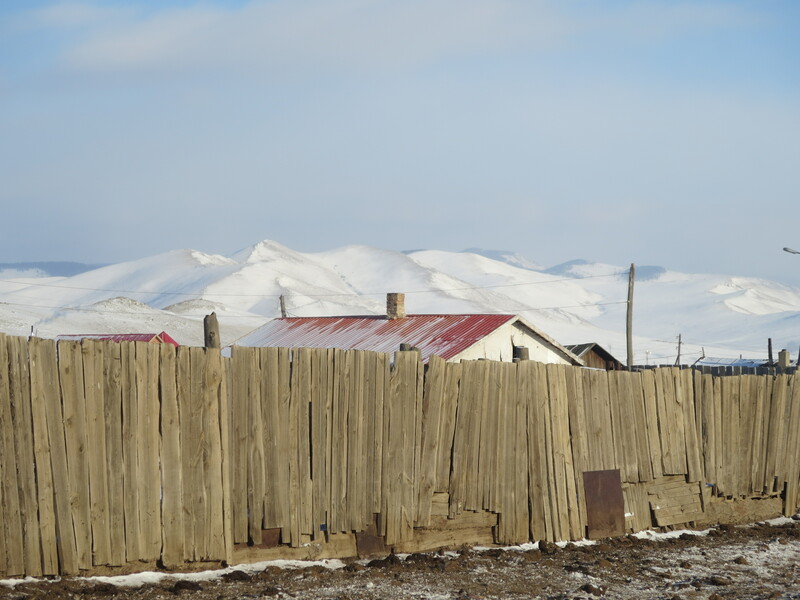 What customs are associated with Tsagaan Sar? 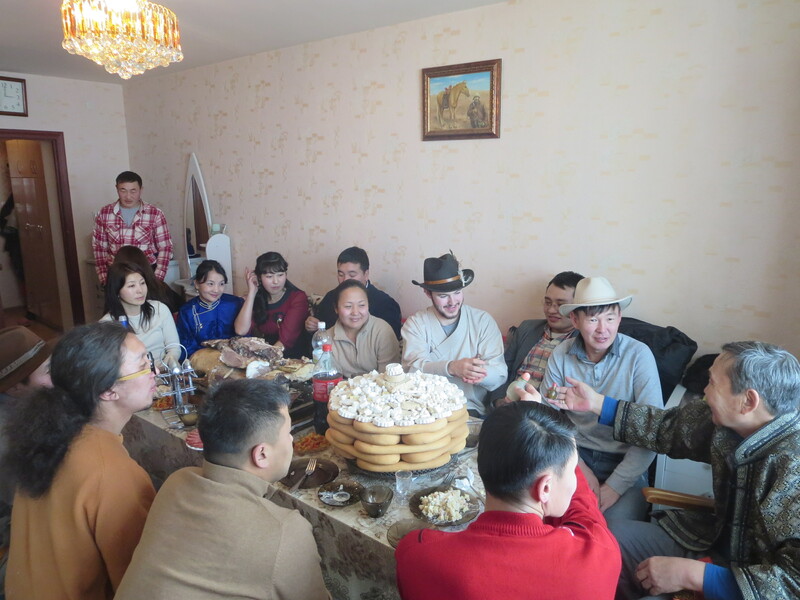 As an outsider, it seems that there are an incredible number of customs that accompany Tsagaan Sar, although many Mongolians insist it’s a very straightforward holiday to observe. Traditionally, it’s vital for the good fortune of both guests and hosts in the coming year that protocol is properly observed. However, the words are only a small part of the customary greeting. Generally, blue prayer scarves called “khadags” are offered by guests to their hosts with open outstretched arms, palms facing up. These are often filled with freshly pressed tugrik bills which are given to the hosts, but this depends on the family and its tradition. A common amount given to one’s host is a 5000 tugrik bill – around three dollars. In preparation for the giving of the scarf, it must be folded into thirds length-wise with the open side facing the host. Hosts often also greet guests with a “khadag” in their outstretched arms but do not offer it to visitors, partially because as hosts they are required to provide many other things. Whether or not there is a transfer of scarves, specific arm gesturing known as a “zolgokh” is required during the Tsagaan Sar greeting. Younger people of lesser rank place their hands underneath the elder person’s arms, gently grasping their elbows with palms as a show of support for their older relatives. The person initiating the greeting, generally the guest, often bows slightly and places his or her head on the left side, then the right of his hosts’ cheeks. This allows the guest and host to sniff one another politely in the process. I’m still not sure what the sniffing is all about but I’m glad I brushed my teeth before most of these greetings! 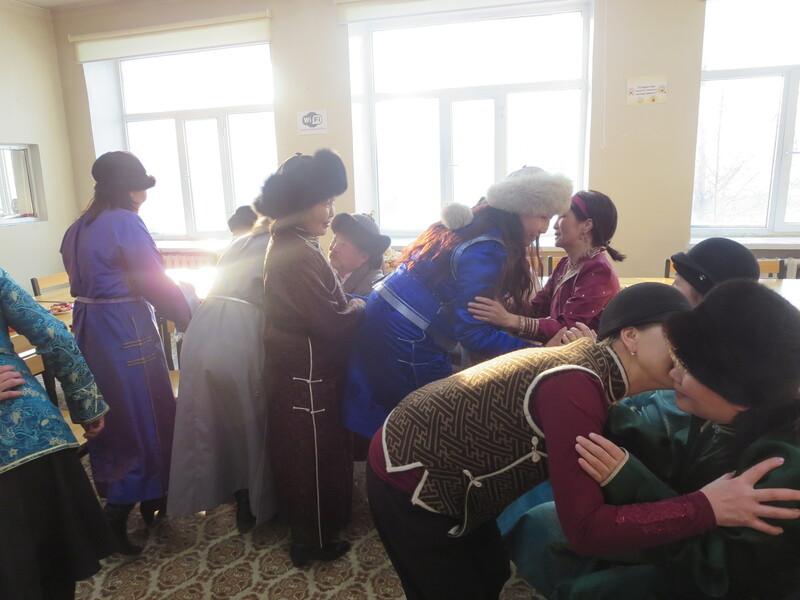 While I’m not aware of any additional female to female greetings performed during Tsagaan Sar, for males of age there is an important custom involving the exchange of snuff bottles. 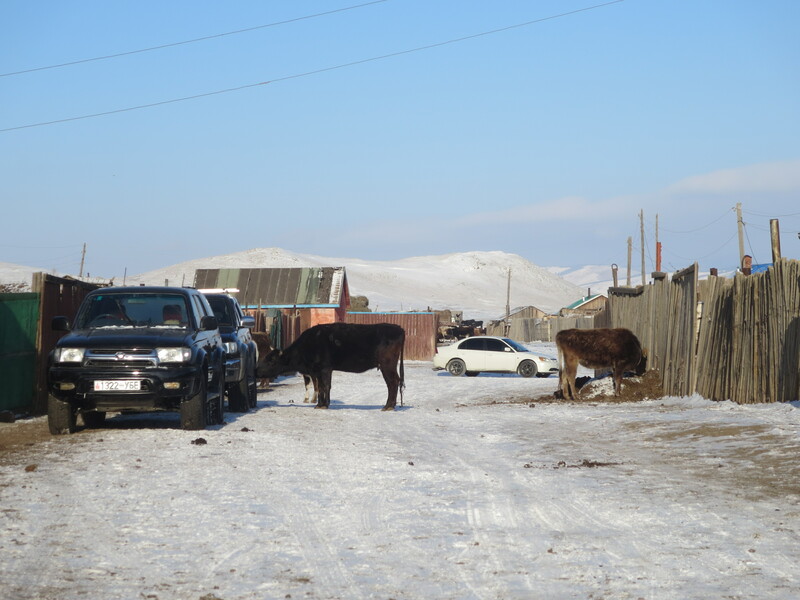 This practice is not reserved specifically for Tsagaan Sar, especially in the countryside where it is customary, but it’s extremely common during the holiday. The polished and engraved snuff bottles, full of pulverized scented tobacco, are kept in brightly colored silk pouches that are stored in the inner breast pockets of one’s deel. The exchange is executed by placing one’s carved and polished stone bottle in the palm of his hand and shaking hands with his comrade who also holds a snuff bottle if he has one. It is considered polite to pull up the wooden or plastic stopper before exchanging the bottles as a sign of respect. Generally, the snuff is not actually consumed which is probably a good thing as it’s clearly unhealthy and addictive. 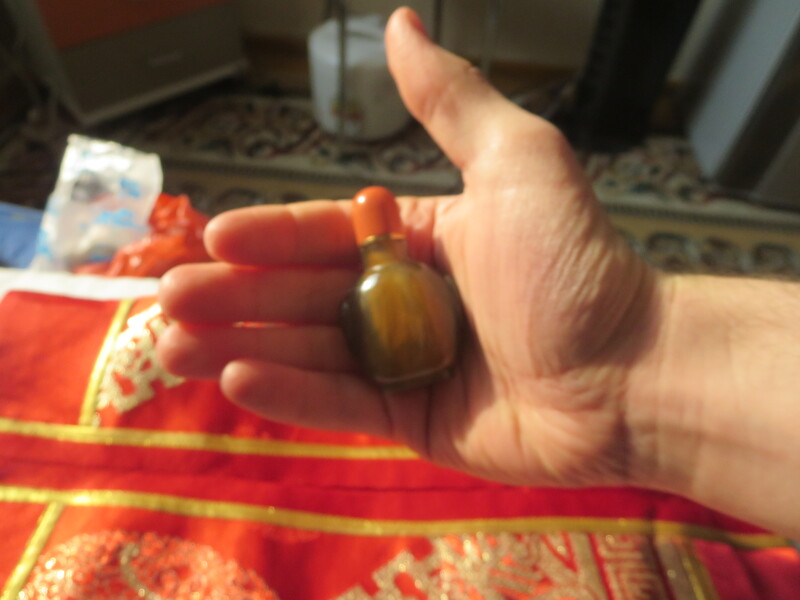 Instead, Mongolian men usually just pull up the stopper up and sniff the top of the bottle on both sides. I exchange my small snuff bottle with my administrator’s husband using the traditional handshake custom. It was fun to visit the homes of several administrators with my coworkers! The proper way to hand off a snuff bottle, with the silk pouch in the background. Occasionally, women also may take part in the snuff bottle practice, particularly if they are older or are from the countryside. 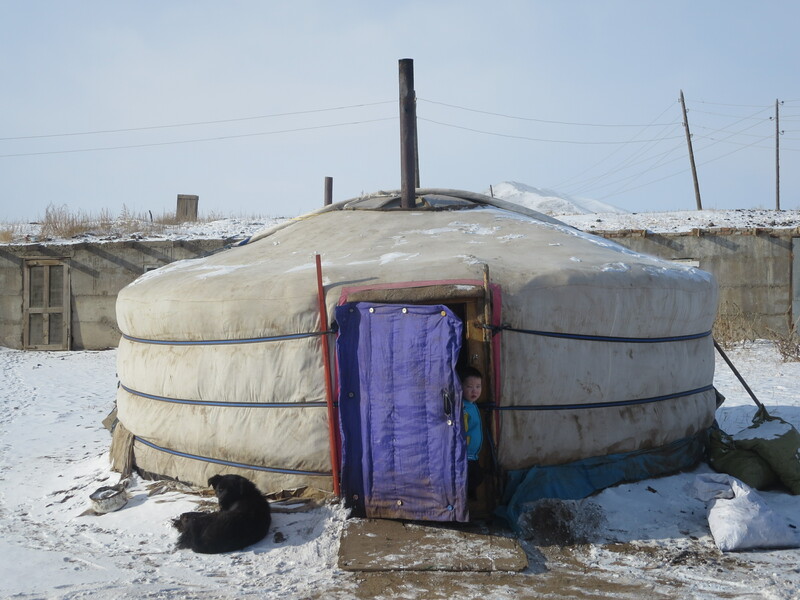 Like most Mongolian traditions, it has its origin among nomadic herders. 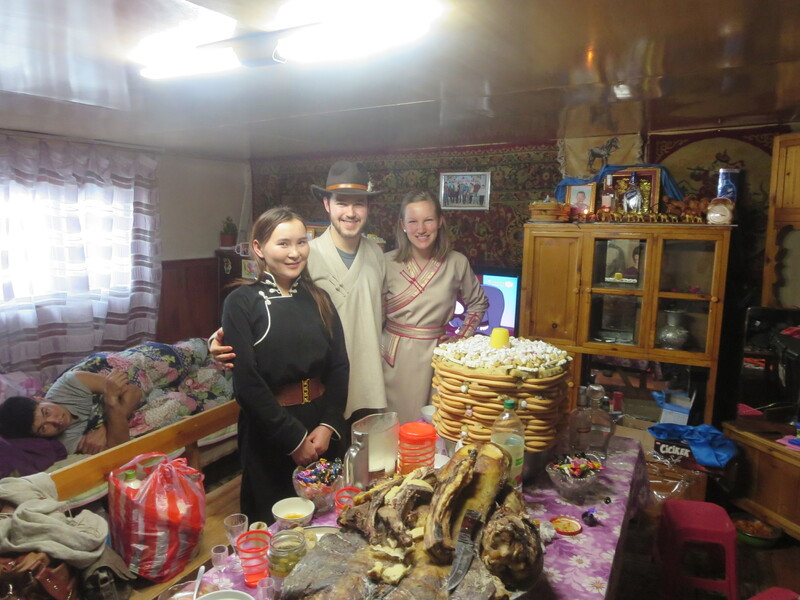 How do people dress on Tsagaan Sar? People generally dress in traditional deels, boots, and decorative fur hats. However, many in the younger generations, especially in the cities, are now choosing to wear western clothing during these visits. Generally, the traditional garments are very warm so people often remove them after the greetings and wear everyday western clothes underneath. If outside or in public the deels usually stay on though. My coworkers are all dressed up for the holiday! 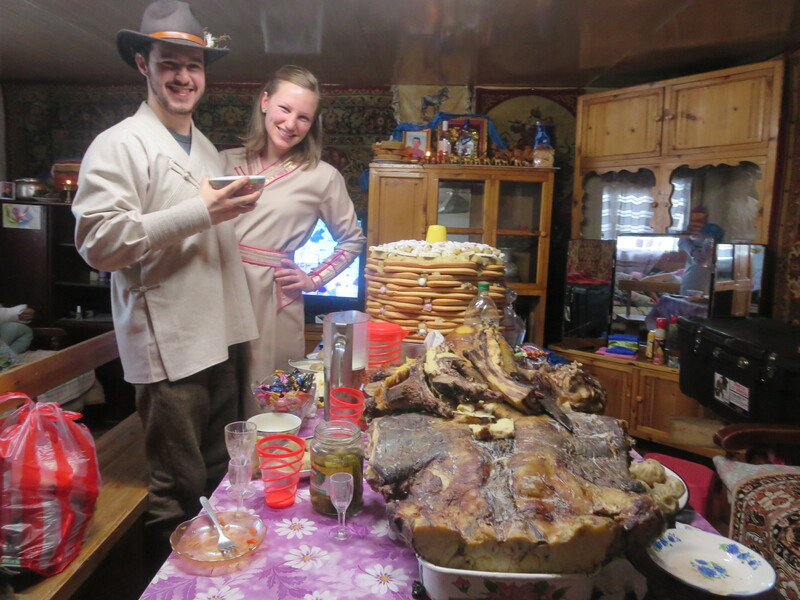 What food is traditionally prepared and eaten during Tsagaan Sar? According to etiquette, first, a bowl of salty, buttery milk tea is offered to guests known as “suutei tsai.” Then a bowl of” airak,” or fermented mare’s milk, is passed around the table until it’s nearly empty and refilled several times. Next, slices of cured mutton are cut off the “uuts” (pronounced “oats”) — a sheep back and tail that serves as the main centerpiece in every household. Katie and I stand in front of the table at our friend, Urnaa’s grandmother’s home. I’m proudly holding the bowl of fermented mare’s milk, “airak,” and trying to battle the array of vodkas placed in front of me in various glasses. 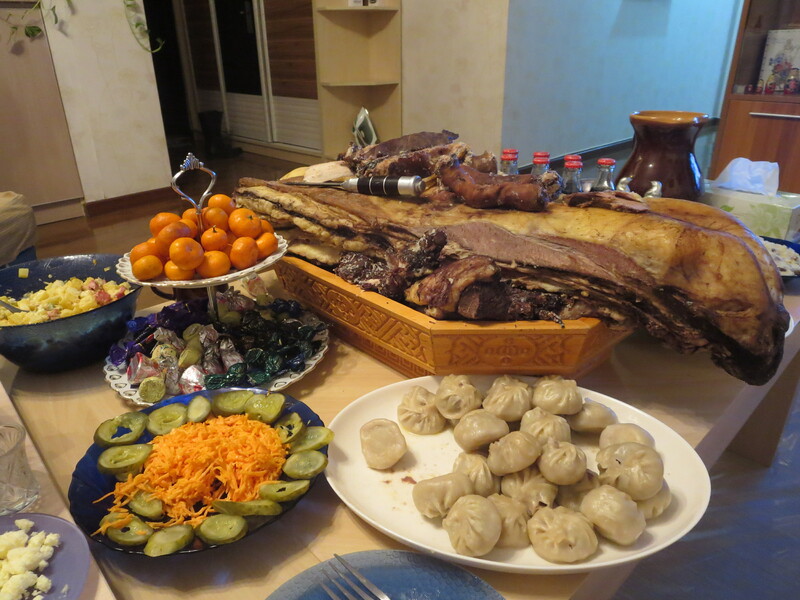 After that, a small mountain of “buuz,” or meat dumplings is presented to each guest. It’s required to eat at least three of them though eating more is generally a sign of respect for your hosts. Next, chocolates and juice are proffered and, if the guests are of age, vodka is poured and several rounds of ceremonial toasts are given by the oldest members of the hosts’ family. The speeches always include well wishes for health, wealth, and happiness for the New Year and continued good relations between the guests and hosts. 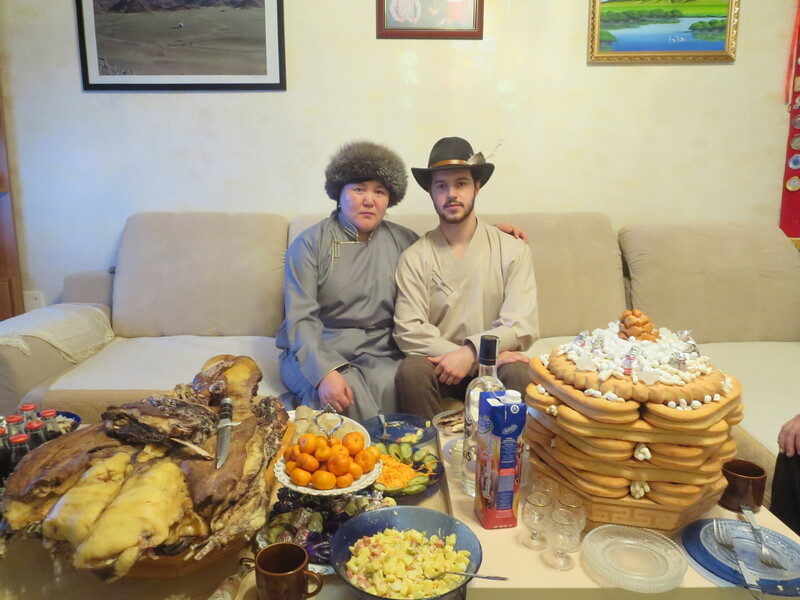 How did you celebrate Tsagaan Sar? I visited six different households over four days and was served almost the exact same foods and beverages at each home – which were delicious! I visited my supervisor’s apartment, my Mongolian teacher’s home, a school administrator’s apartment, and a coworker’s suite in the city. 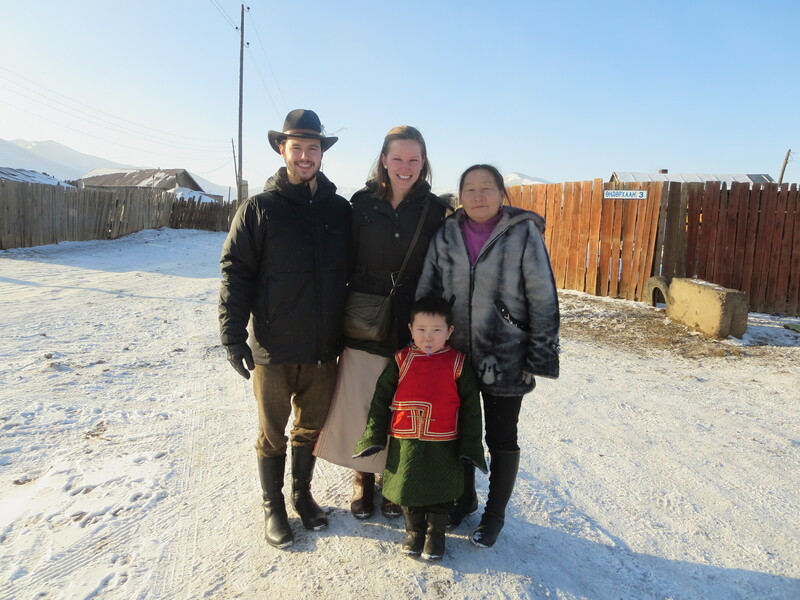 I also visited a Mongolian friend’s mother and grandmother, who live in a small village an hour outside of Ulaanbaatar. 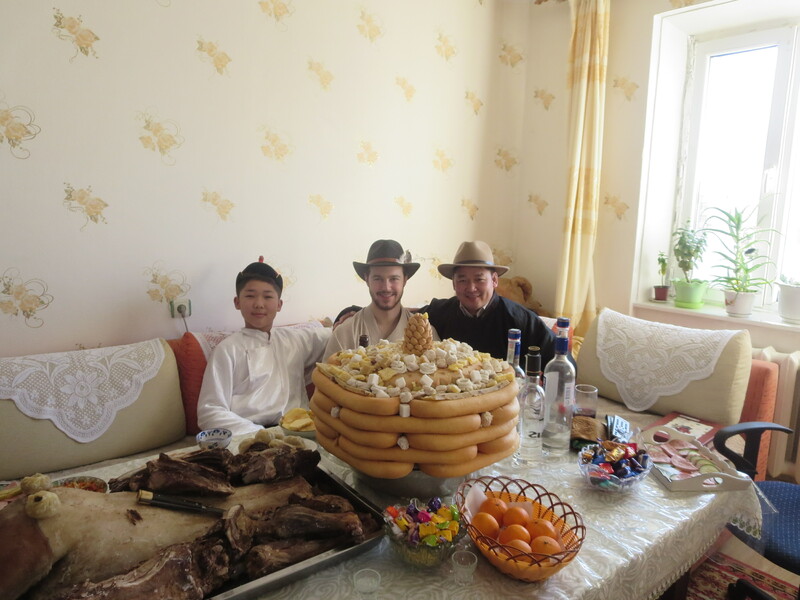 Between the visits I had enough buuz and vodka for the entire Year of the Horse! Urnaa’s mother’s ger, with a small visitor and his trusty companion bidding us farewell. Me with school faculty. For some reason most of them took off their “deels” after the official ceremony. How was your commute to the countryside during the busy travel weekend? We took a minibus to the village which only runs a couple times a day. Unlike most forms of public transportation, we had to wait until the bus was entirely full before it left! (I suppose if I were working on a holiday driving in the snow through the Mongolian countryside I would want every seat full too.) Katie, Urnaa, and I were the first ones to jump in the back and we waited for about an hour until the bus was full and then another half an hour for the drivers to smoke enough cigarettes to go! 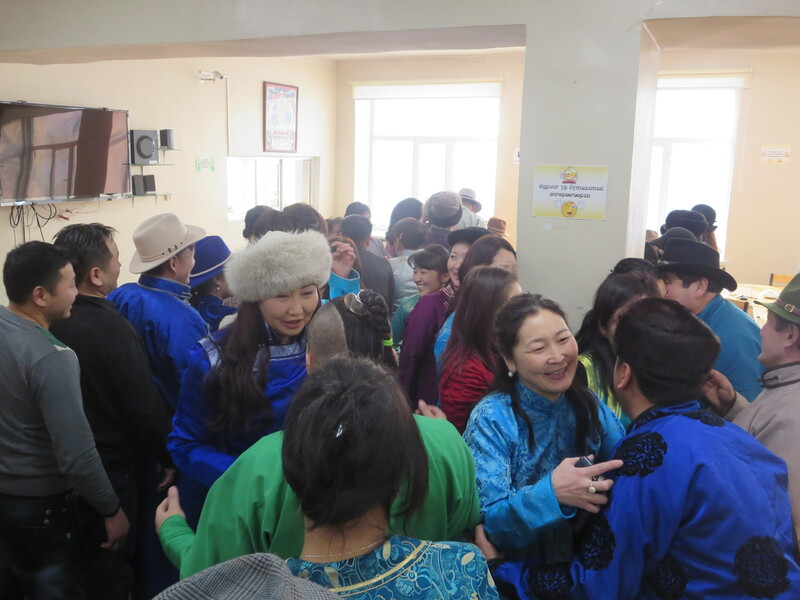 During out trip back to Ulaanbaatar, after celebrating with Urnaa’s family, our drivers somehow crammed 29 people in a 14 passenger van! It was the last bus running to the city that day so everyone wanted to get on it to visit relatives for the last day of the official celebration. The driver, who made about twice as much money as usual with the extra passengers, had no complaints either! There were ten people in our row that only had seatbelts for three! Elderly men and young children sat on tiny wooden stools where our leg room would normally be. Everyone had someone else’s arm or leg jammed into their side! As you can imagine, the bumpy roads were not fun. Also, as you can probably guess, there is not much enforcement of seat belt laws here… Not good! The village’s views of the nearby mountains were wonderful! Traffic jam? Since when do cows graze on tires? Our good friend, Urnaa, was a wonderful host and translator for our visits in the village! Urnaa’s mother and grandson were kind enough to bid us farewell before we hopped on the crowded minibus! What games did you play for the New Year? 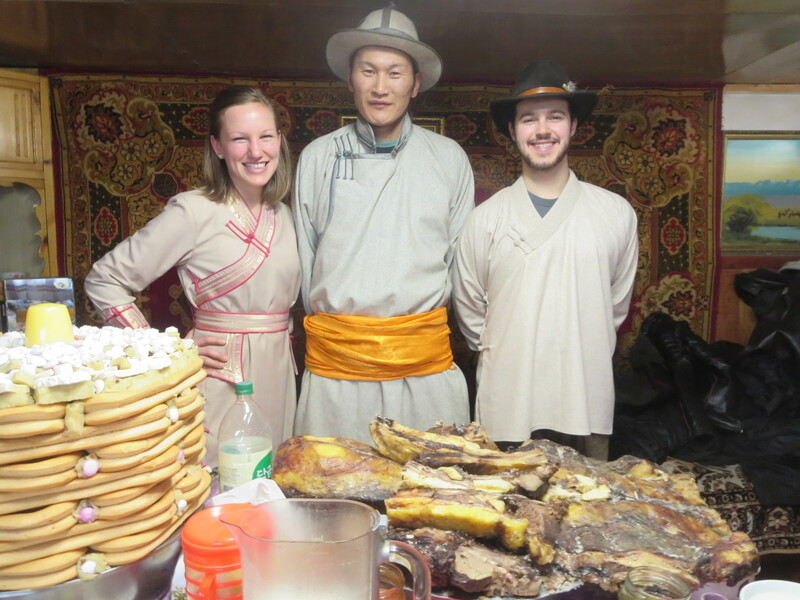 I played with “shegai,” or sheep ankle bones, at my friend Shine and Oko’s house during my Tsagaan Sar visit. There are many types of bone games played by locals, who also use the ankle bones to forecast the future – especially for the New Year. There are four distinct sides to the bones that are each named after a different type of livestock. The sides are named after sheep, camels, goats, and horses. Certain combinations of these are seen as auspicious, or likely to bring good fortune, while others are believed to bring bad luck with still more representing “average” outcomes. According to my friends the best possible roll is having four different sides facing up. Many Mongolians take these fortune-telling methods very seriously. There are only three possible casts of the bones allowed for the fortune telling, after that it’s believed that the rolls do not accurately reflect one’s fate. I rolled two average combinations of several sheep and goats, and one favorable one with two horses, a goat, and a sheep. Horses are seen as very good luck! 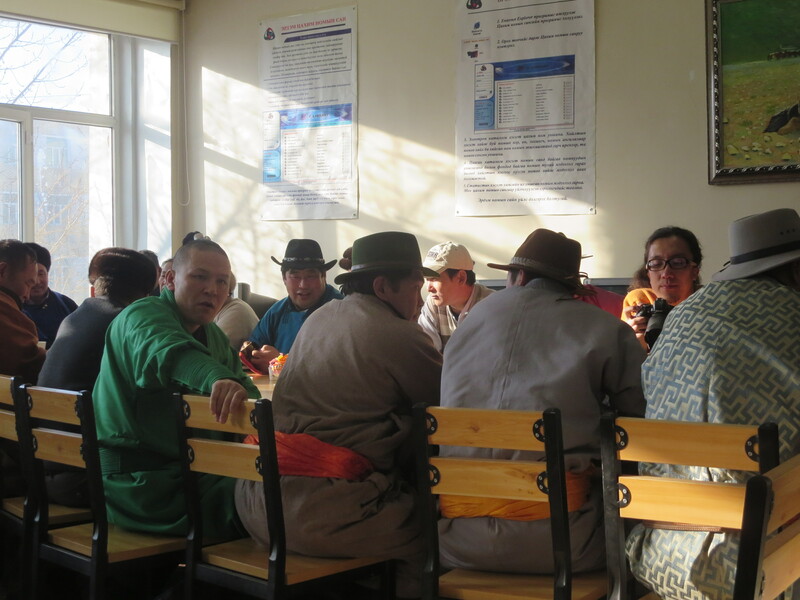 Hats are very important on Tsagaan Sar! Wishing you a happy, healthy, and wealthy Year of the Horse! 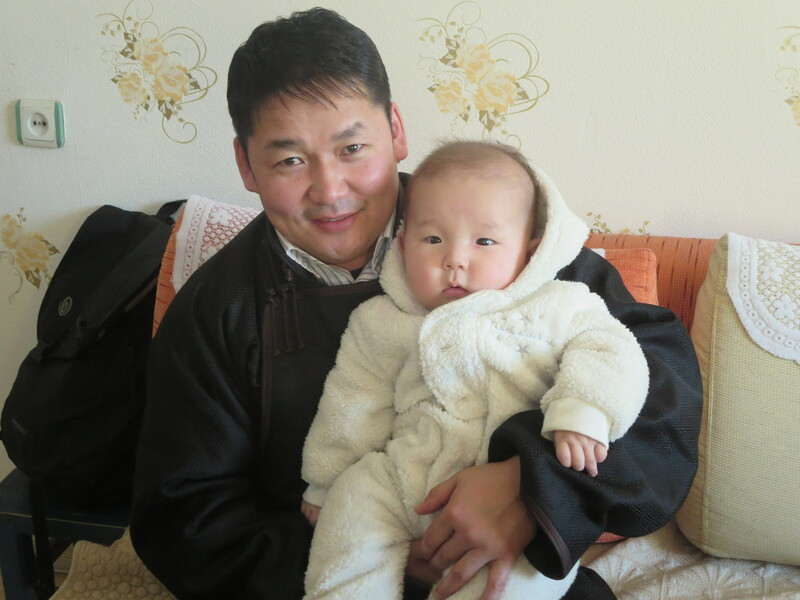 I love spending time in Mongolia. My wife a lovely Mongolian lady helps me with the culture and traditions. I have spent two winters and one summer there. Just wonderful. Yes the New Years celebrations are exhausting to say the least. All the eating and drinking. The part I like the best is meeting all the people and relatives. They are a family based society and go out of their way to help family when possible.